This post was originally named "Extremely Chocolatey Chocolate Cake". It was named thus because our host, Felice of All That's Left Are The Crumbs, asked us to honor our Father's this month in preparation of Father's Day and make his favorite cake. Pops also loved his Buddy Boy. I'm sure they are inseparable in Heaven as they were on Earth. 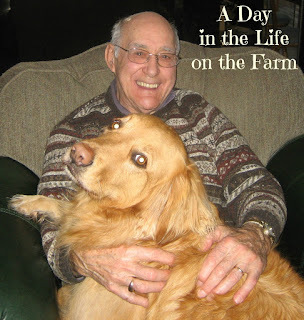 When I met with the Priest to plan Pops' funeral he asked me to tell him about my Pops. Father was new to our parish and had not gotten to know Pops very well as at the end of his life he was no longer able to attend Mass as he always had. I told Father that Pops loved God and family most of all. That his wife of 70 years was still the apple of his eye and his devotion to her knew no bounds. He loved to fish, play cards, drink beer and he loved chocolate!! My Pops was a chocolate nut so I decided to make the Extremely Chocolatey Cake in memory of him. So I made up a chocolate cake batter and added white chocolate chips and milk chocolate chips just for good measure. Then I put it in the oven to bake. The plan was to make a bittersweet chocolate glaze to drizzle over the top making this a quadruple chocolate treat. Oh.....Calamity!!! I always, always, always generously treat my bundt pans with baking spray. When I reached for it and saw that I was out, I told myself to run to the store before finishing the cake. Then, that little devil on my shoulder said "Pshaw" and "What do you think they did before the days of baking spray". So I pulled out the shortening and the flour and I really thought that I had done a thorough job of preparing that pan......I should have run to the store. Oh......Calamity!!! I also thought about naming this post "Don't Trifle with Me" because what should you do if, God forbid, this happens to you and you are having 16 guests for dinner in a few hours? You should do as I and "Turn that Tragedy into a Terrific Trifle". That would have been a good name for this post as well. Simply make up some pudding. Whip up some cream. Crumble the rest of that Bundt and start layering. Throw some nuts on at the end just as a reminder of the nutty day you have had. I know that my Pops would have loved this trifle....ooey gooey chocolatey goodness in each and every bite. My guests were crazy about it and couldn't resist going back for seconds. The "Disaster turned into a Dreamy Dessert". This post could have had numerous names! Mix together the flour, cocoa, baking powder and salt in a bowl. Set aside. In the large bowl of a stand mixer, cream the butter and sugar until light and fluffy. Add the eggs, one at a time, beating after each. Add the flour mixture to the butter mixture alternately with the buttermilk, beating after each addition, starting and ending with the dry ingredients. 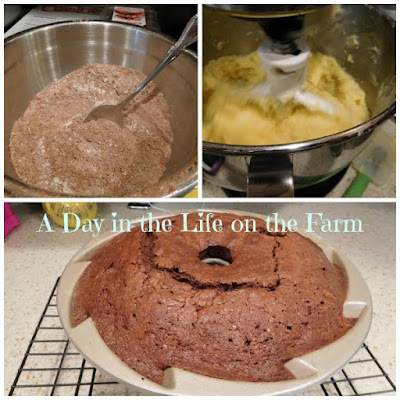 Pour batter into a 12 cup bundt pan that has been liberally treated with baking spray. Bake in a preheated 350* oven for 1 hr and 15 minutes or until a skewer inserted removes cleanly. 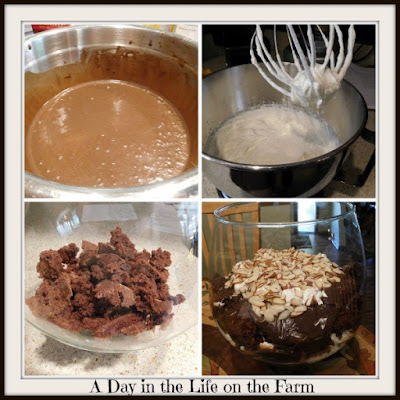 1 extremely chocolatey chocolate cake (find recipe here), broken into pieces. You handled your calamity just like a professional, and it looks fantastic. There is always that slight moment of anxiety when you have to un-mold a bundt cake, you hold you breath and hope for the best. 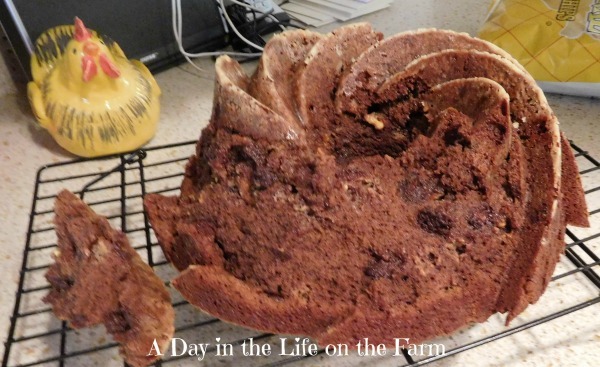 Luckily I now have a great idea of what to do when the bundt sticks. Thanks Felice and thanks for encouraging me to post with the group as well. It really was sinfully delicious. It must have been nice to have had a father who loved chocolate, mine doesn't, which means no chocolate just lying around the house waiting to be eaten! Great job saving this cake...the trifle looks super yummy! Thanks Colleen, it also means you didn't have to fight over who got the last of the chocolate. Seriously though, my Pops often had chocolate in his pockets that he would share with me when he came home from work. I love this chocolaty cake, looks great. Happy that you posted this cake post. 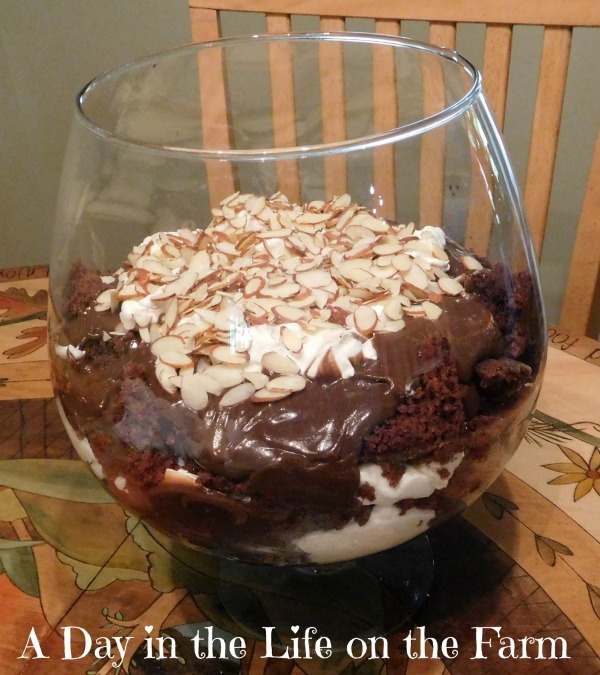 Great way to use cake and make a another dessert with it. Thanks Sneha. It was really delicious. Just one wrong step... and you used a very demanding bundt pan, with sharp edges. All of us have disastrous moments in the kitchen, but I think just few have enough patience to make from it successful meal, as you did. Nice rich chocolate cake! 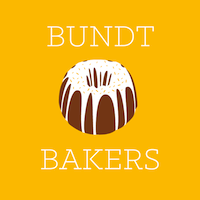 Thank you Katin and welcome to Bundt Bakers.